Bring your South Asian-inspired wedding to life with the vibrant colors and traditions of India at these luxurious resorts in the Caribbean and Mexico. Introducing The Dulha & Dulhan Package by AMResorts. Experience a destination wedding where your traditions and customs will be honored through their expertise and devoted, personal attention. The package includes an elegant Mandap decorated with colorful backdrop and drapery, choice of pillows or Tiffany-style chairs for family members, white-linen covered chairs for guests, sound system, beverage station offering cold water, juice and soda throughout the ceremony, and a shoe check station for beach ceremonies. - Sangeet & Mehndi: A four-hour event complete with an intimate stage area with colored draping and seating for two for the wedding couple, white linen covered tables and chairs for guests, an appetizer station, buffet offering a complete salad bar and three entrée options, and a dessert station. 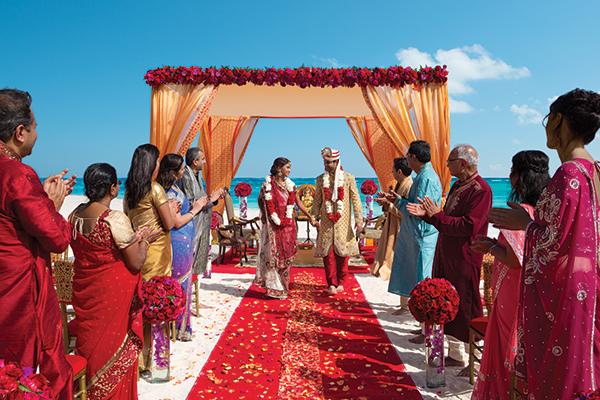 Visit amresorts.com/southasianweddings for additional inclusions and bonuses! Palace Resorts brings your dream wedding to life. Wedding décor and exotic floral arrangements juxtaposed by the breathtaking beauty of the destination’s Mexican-Caribbean setting come together to create a truly memorable and authentic Indian ceremony. Personalize your traditional South Asian destination wedding when you select one of the Palace Resorts in Mexico or the Caribbean for your big day. The Indian wedding package includes everything you need, from the wedding planner, music director, expert henna artist, Mandap décor, and your very own Honeymoon Wishes Registry. For more information visit weddings.palaceresorts.com or call 1-877-725-4933. The perfect combination of luxury and romance in one of the most idyllic spots in the world, the Barceló Maya Grand Resort is an ideal destination for authentic and unforgettable Indian, Muslim and Sikh weddings. Barceló Maya Grand Resort’s staff has the resources and expertise to transform wedding dreams into reality, whether you are planning a ceremony, Haldi, Sangeet, Mehndi, or an elaborate celebration that reflects your heritage and can host unlimited functions up to 4 a.m. in both indoor or outdoor locations to keep the celebration going late into the night. Each Paradisus Resort has the experience and knowledge to prepare, customize and host truly traditional South Asian weddings—and even those with a modern twist. This includes but is not limited to Indian and Persian celebrations. Starting with the Mehndi party to the Sangeet, and from the Baraat to the Mundap to the Seven Steps—from the ceremony to cocktail hour to the reception, the romance team will be right by your side offering personal and exclusive service. Their amazing romance team provides exquisite menu offerings and breathtaking décor options in tropical locations or majestic ballrooms that will leave the couple yearning for more of what Paradisus offers. For more information visit romancebyparadisus.com or call 1-877-276-0872. Renowned New York City wedding stylist, Karen Bussen, has unveiled a South Asian Simple Stunning Wedding package, Shaadi Royal Bliss, targeted to South Asian brides, at Palladium Hotels & Resorts in Jamaica. The flexible package features four deluxe events: Goddess Mehndi party, Sangeet/Music Night Celebration, Baraat and Marriage Ceremony, and Vivah Wedding Reception and Dinner. For more information visit palladiumweddings.com.